First, freedom of navigation in the South China Sea is already protected under international law. Every year, more than 100,000 merchant vessels, which between them account for one third of the world’s seaborne trade, pass through the South China Sea. Never has any single one of them been interrupted or impeded. For China, the world’s largest trader in goods in 2018 (with trade valuing $4.62 trillion) and a key trading partner for more than 130 countries and regions in the world, the South China Sea is the route taken by more than 60 per cent of its seaborne trade. The majority of the goods traded between the UK and China, which last year topped $80 billion for the first time, were shipped through the South China Sea. What’s more, 85 per cent of our energy imports also pass through it. There can be no doubt that the South China Sea has the world’s busiest, safest and freest shipping lanes.Those who keep calling “freedom of navigation” in the South China Sea an issue are therefore, as a Chinese adage so aptly describes, “worrying about troubles of their own imagination”. The parties have also agreed on China’s proposal to complete COC negotiations within three years. The relevant disputes have not affected the development of bilateral relations between China and other states in the region. Rather, they have prompted the parties to sit down together and discuss plans to achieve stability and safeguard peace. The most recent example was President Xi Jinping’s successful state visit to the Philippines, during which China and the Philippines reached a Memorandum of Understanding (MOU) on future co-operation on oil and gas development in the area. Which brings me to my third point, the behaviour of other countries who choose to send warships on so-called “freedom of navigation” operations. The South China Sea is more than three million square kilometres in area and has numerous shipping lanes. However, some still choose to steer their navy warships close to the waters adjacent to China’s islands and reefs. Some even illegally enter China’s territorial waters. These moves flagrantly infringe upon China’s sovereignty and maritime rights, deliberately drive a wedge between China and its neighbours, and exacerbate regional tensions. 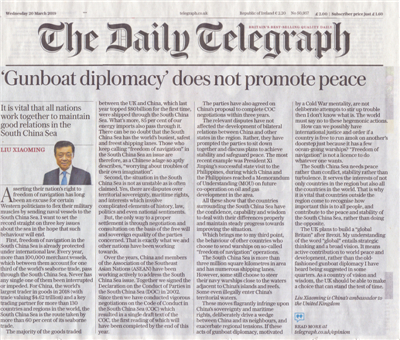 If these acts of gunboat diplomacy, motivated by a Cold War mentality, are not deliberate attempts to stir up trouble then I don’t know what is. The world must say no to these hegemonic actions. How can we possibly have international justice and order if a country is free to run amok on another’s doorstep just because it has a few ocean-going warships? “Freedom of navigation” is not a licence to do whatever one wants. The UK plans to build a “global Britain” after Brexit. My understanding of the word “global” entails strategic thinking and a broad vision. 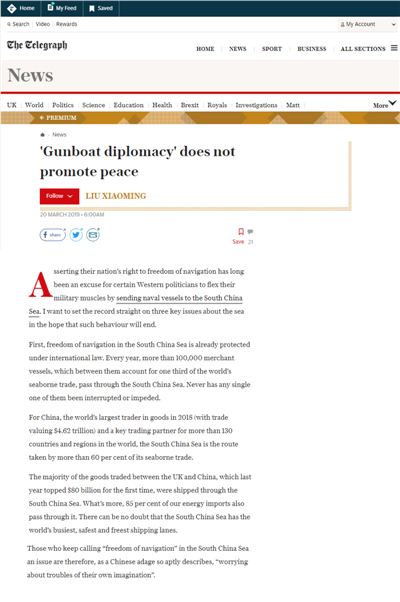 It means active contribution to world peace and development, rather than the old-fashioned gunboat diplomacy I have heard being suggested in some quarters. As a country of vision and wisdom, the UK should be able to make a choice that can stand the test of time.